It looks like people have finally had enough with Frontier’s sub-par quality of service around here. 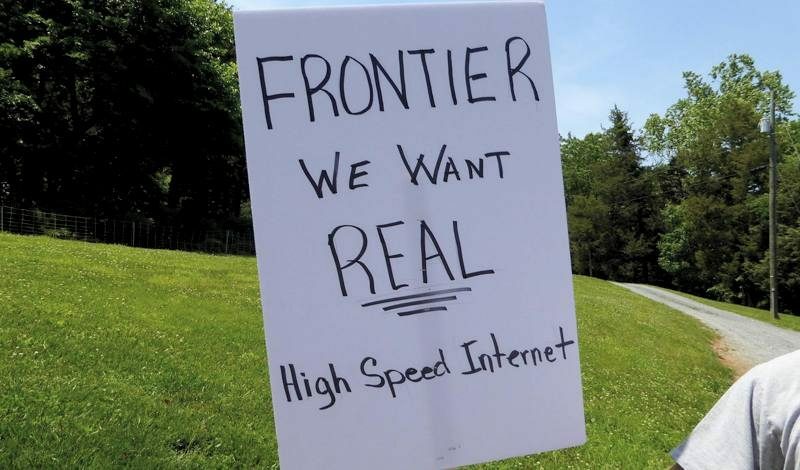 The type of internet that Frontier provides is prone to more issues due to the way it is delivered. Digital Subscriber Lines work by transmitting a digital signal over 2 ancient copper wires, usually all the way from your house to the phone company’s Head End. The problem is, there aren’t many Head Ends around here and the wires between you and the closest one are most likely very old. This means every time the wind knocks around some wires, water gets into some underground stuff or an accident takes out a hub around town, there’s a good chance it affects you. This also means it’s very expensive to maintain. If you’ve ever signed up for new DSL service, you may have noticed a delay between calling them and actually getting working internet. This is because they have to send crew(s) out to upgrade/repair/install equipment at possibly hundreds of checkpoints around town between you and the Head End. Well now those checkpoints are aging and they could all use some freshening up, except you’re not a fancy new customer anymore and too many people need a freshen up. This makes it very cost prohibitive to the phone company. Unfortunately for the phone companies and people that are stuck depending on them, they are a dying breed. Cell phone and hot spot speeds are much better even in areas with poor signal. And as much as I dislike Comcast/xfinity, they’re internet usually functions somewhat consistently. If Comcast is able to provide you with working internet, there are several options for internet phone service that won’t push you into one of Comcast’s magic money saving packages that cost a lot more. I have Comcast basic cable and high speed internet, then I use Netflix and Amazon video for tv. If I need a home phone I get one from Vonage. This rally on June 8th is a great idea and worth participating in, but I highly doubt Frontier is capable of resolving this issue. Sometimes your poor internet connection could have something to do with the devices in your home. If you are having issues, give me a call and I’ll help you figure out what’s going on. Visit my local computer repair website at http://support.wvpan.com. How bad is your internet speed? Show us your bandwidth! Do you have Frontier problems? If you have been experiencing slow internet…I mean less than 4.0 Mbps or had numerous disconnections, please join us in a rally for better internet service. Frontier needs to spend some money if our internet service is ever going to improve! Frontier needs to know it’s not just a couple of people complaining…Frontier needs to rectify a dated system. How: Make a sign if you like, bring a chair, and let’s see if we can get Frontier to be accountable? Frontier, please give us REAL High Speed Internet. Give us what we pay for! More DSLAMs (Digital Subscriber Line Access Multiplexer) or fiber optics would be a step in the right direction.